It is Monday here in Boston, MA and the fog of the G20 has lifted while the FED storm clouds remain parked on the horizon. The G20 was Turbo Timmy’s attempt at MOPE(Management of Perceived Economics) and it obviously has left him mopeing. Just for a moment we will leave our bumbling protagonist to mention the second bumbling character in our dark comedy Ben “B52” Bernake. I have no proof of this but it appears that the negative statements that were coming out regarding QE2 last week were coordinated because Ben and Timmy knew ahead of time the outcome of the G20 that no real agreements would be reached and they needed to enact some jawboning or MOPE to mitigate the market run up but at the same time create a distraction to avoid a potential market meltdown. Back to Turbo Timmy and his spectacular performance at the G20. I am sure dear reader that you are smarter than the average American and took many of the pronouncements prior to the G20 with a grain of salt, since you knew or at least suspected that there would be no agreements reached as I detailed previously in my “What Ya Talkin’ Bout Timmy” and “Theory Vs. Reality” posts. I know dear reader you may be thinking that I am beating a dead horse at this point but I would submit to you that there are a couple factors in play, including the G20 meeting outcome, which will affect and shape your investment perspective. Obviously the first is the G20 meeting, however, there still is the Nov 2 midterm election as well as the Nov 3 FED meeting. For the moment let’s focus on Timmy and his accomplishments at the G20. Timmy came out with a plan that I mentioned in my blog post, but appeared originally in the Wall Street Journal, which stated that his goal was to move to rebalance the world’s economy and fix the currency balance too. Now dear reader you don’t have to be a market expert to understand that this idea did not have a snowball’s chance in hell of being agreed to, you just have to understand human nature. It is basic human nature that one is not going to agree to things that you perceive as limiting or harmful to one self or one’s country. Human nature also explains other market dynamics but I will cover those in a different post as they don’t directly pertain to this conversation. So what is the result of Timmy’s adventure in Seoul? For starters we got a verbal pledge from most of the ministers of the countries present that they would try to avoid competitive currency devaluations aka currency wars. How effective will this pledge be? I give it a week tops. Once again human nature dictates here it is not what is in the best interest of the world economy but instead the individual players or countries. The net result is that this pledge will be unenforceable and as steadfastly held to as the scene in Monty Python’s “Holy Grail” where Arthur’s brave Knights run in to a spot of trouble and their battle cry becomes “run away, run away”. This pledge has even less sticking ability then OPEC’s pledges not to cheat on oil production quotas even when the quotas are in their collective best interest. The second significant thing to come out of the G20 is the fact that while the nations pledged not to engage in a currency war, not a one of them was willing to relinquish their sovereign right to manipulate their currencies up or down as they see fit. No one wants to be the loser in the race to the bottom. To go one step further as I had put forth the premise in my post “Do As I Say Not As I Do”, Germany and China have woken up to the fact that US is doing exactly the opposite of what they are preaching. The US under the leadership (or lack thereof) of Ben and Timmy are issuing debt and running the printing presses respectively, while pushing for stabilization pacts and global rebalancing. The problem is that the US’s credibility has been severely tarnished so other countries do not trust the fiscal leadership coming from Washington as they see that every proposal is geared toward “extend and pretend”. The rest of the world has figured out that the current fiscal philosophy is designed to maintain the power regime in Washington by trying to mitigate the debt bubble damage and keep the “sheeple” from feeling any pain if possible. Many of you have heard the old fable of the frog in the pot where the heat of the water is gradually raised so it has no sense it is being cooked; unfortunately this is the fate of the US. To add to the currency problems are the debt problems of the US. I had detailed in an earlier post entitled “MOAB Mother Of All Bubbles” with the recommendation to avoid US treasury debt due to it being a bubble particularly the long end. Many people and institutions have been running to the perceived safety of the US Treasury market. 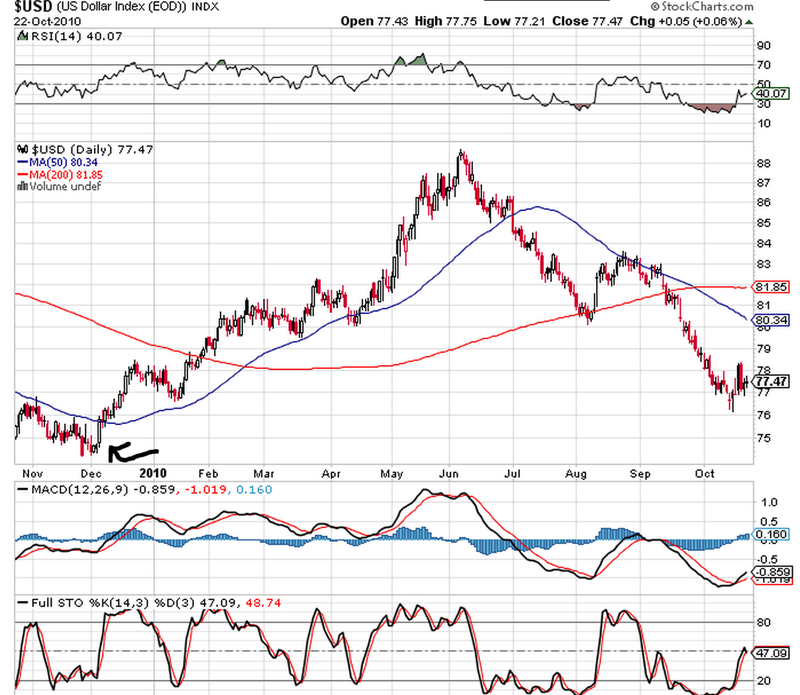 It is still a mistake to run to Treasuries as Ben and the FED have painted themselves in to a corner. Over the past year the FED has monetized approximately $1.7 Trillion and we still need inflows of $125 Billion a month to buy our debt to keep the wheels “on the bus”. At the same time we are running a trade deficit of $45 billion a month meaning in essence as a nation we are consuming roughly $170 Billion a month of the world’s capital, no chump change. To add fuel to the fire Ben’s excellent (insert guitar riff here) plan much of the debt and deficits on the order of 65-75% of it was and is financed at short term rates instead of 10 or 30 year rates. The implications of this financing is that trillions of dollars of debt will be rolling over in 2011 and 2012, since the favored vehicles for Ben are the 3 and 5 year note and the crisis began in 2008. Why should you care dear reader? In the near future will the US will need to finance more debt and simultaneously we will have to refinance the existing issues coming due; so in essence it will be like financing double the amount and that my friends is a whole lot of coin! Additionally, 70% of all the US debt has duration of 7 years or less which will just be pouring more gas on the fire. So while this has all transpired the US has sold its debt to other central banks and commercial banks but the fact that sends up warning flares for me is that $900 Billion has moved in to Treasuries and bond funds from John Q over the past couple years. There has been much talk about the withdrawal of funds from the equity markets, well where do you think they migrated to dear reader? Here is where Ben’s excellent adventure becomes treacherous. Ben understands the precarious nature of the economic situation we currently find ourselves in, but what is he to do? The rhetoric has been running hot and heavy and that has gotten him quite a way along on this adventure, but there comes a time which is rapidly approaching where he will have to $h1T or get off the pot. Ben knows that neither the economy nor its citizens would cope well with rising rates at this point so he has a conundrum; does he sacrifice the economy or the Dollar? My money for what it is worth is on the Dollar, however, the market will ultimately dictate the outcome that Ben will not be able to stop. You see dear reader that as Ben sacrifices the Dollar on the altar of Keynesianism, people around the world are not stupid and will demand to be compensated for the redcuction in purchasing power of the dollar. 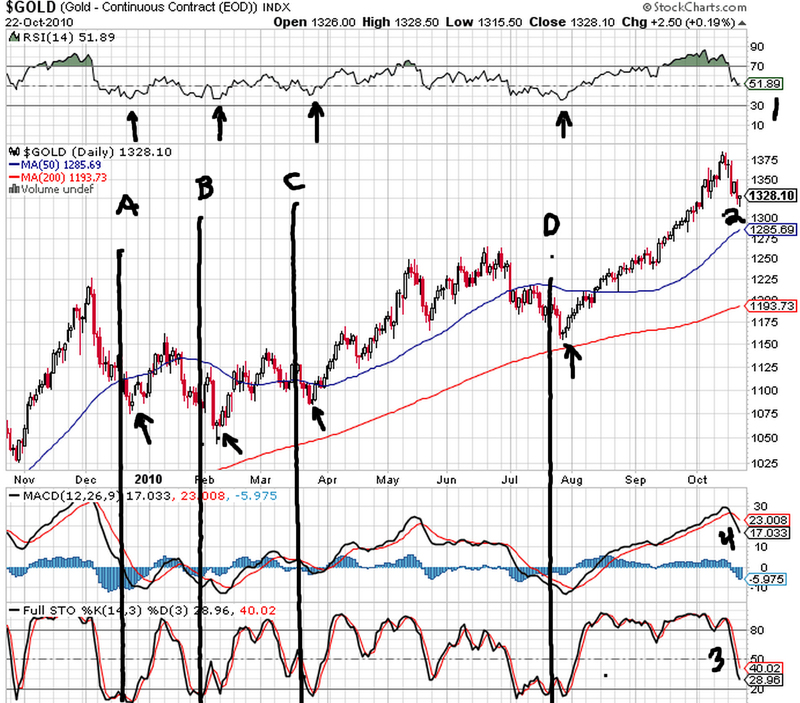 The net result of the demand for compensation will be that the market will force rates across the yield curve higher. The US economy will not handle the rise in rates very well so there will be screams from the market to save us Ben. At first the FED will be reluctant, but it won’t take long before they begin QE3 then QE4 etc… The FED will find itself caught in a viscious cycle as each time they QE to stem the rate rises the Dollar will take it on the chin. The Dollar weakness will in turn fuel domestic inflation and drive the deficits higher and lean on interest rates again. This is all reminiscent of what has happened to every FIAT currency which is not backed by anything tangible over time from Ancient Rome, late 1700's France, Revolutionary US, Weimar Germany and more recently Argentina. The deflationists argue that this type of scenario and other inflationary scenarios will not play out because the FED won’t purchase these so called assets, to this argument I say well they already have and Ben will use “emergency powers” to justify purchasing whatever he sees necessary. They will also argue that Ben and the FED won’t do anything that might damage their balance sheet; to which I say why? Has the FED under Ben not already exchanged Trillions in Toxic assets from the banks, is that not a precedent? I believe that the FED and Ben are no different than the habitual gambler that is down on his luck who maxes out his credit cards to gamble again to get even. If the financial system is in a tailspin Ben will buy everything and anything taking on the risky assets rather than let everything circle the drain where you can be sure dear reader that Goldman Sachs will be waiting. This diatribe is yet more justification, dear reader, to buy tangibles and stay out of debt. There are those that point out that there were recently 95% bears in the dollar ant therefore tangibles would fall as the dollar rises, however, that has not borne out and the dollar has barely rallied and alleviated much of the oversold condition. Moreover, I did a quick study using the ETFs NYSE:UUP (Dollar Bullish) and NYSE:UDN (Dollar bearish) to see where the general public is regarding their feelings about the dollar. 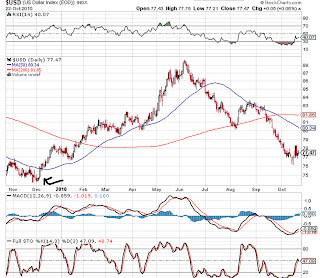 It would appear the public buys Timmy’s stance on the stronger dollar, which you can see in the chart I plotted below. It seems to me that this is a better predictive indicator since like options player and odd lot sellers the public generally get it wrong and since the bloodletting in 2009 they have been bullish on a proportional flow of funds based on volume and dollar value. The exception in 2010 was on 5/27 where the ratio fell to .9 and change, indicating that more dollars were flowing to the dollar bearish ETF. I have attached some charts below (you can click on each chart to enlarge) for your review and tomorrow I am sure there will be plenty to talk about as I see Ben is blabbing on the flat panel again and Mr. Obama has turned in to the newest “Deficit Hawk” …uhh ..yeah…right! Till tomorrow….I remain your humble author stuck on Ben and Timmy’s Not So Excellent Adventure…!. 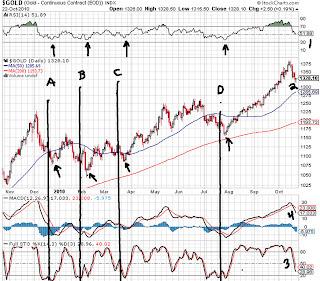 Note from late 2009 the general public has been buying the Dollar Bull ETF and the trend continues. Just like the odd lot buyer is an indicator of being on the wrong side of the trade so is this. 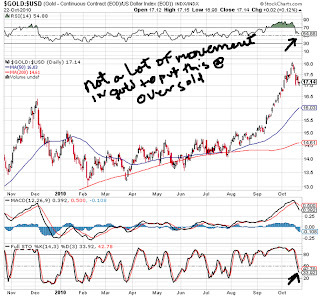 The chart shows how little movement in price was required to temper the "oversold" condition of the dollar meaning there was not much real strength behind its rise. 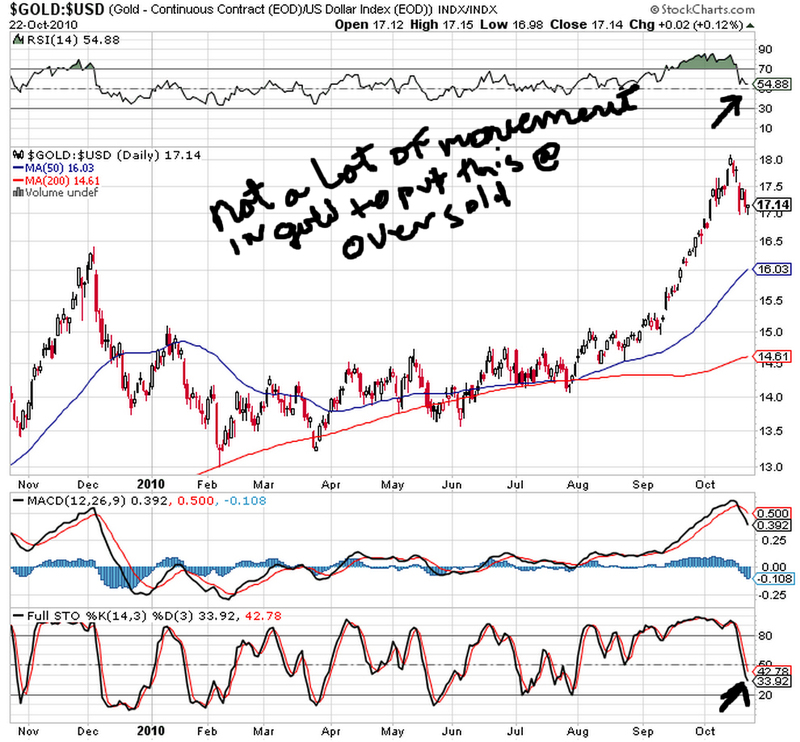 I have noted prior inflection points in the gold market and you can see while none of the points exactly matches the other they all rhyme pretty well.